Published by Registry of Guitar Tutors. ISBN 9781905908134. 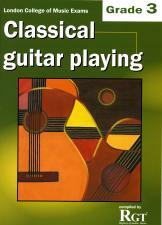 This handbook is intended for early and intermediate level students of the classical guitar. It is primarily intended for candidates considering taking the London College of Music Grade 3 examination in classical guitar playing. However, even if you do not intend to take an examination, given the handbook's wide content of musical repertoire and extensive educational material, it provides an expertly structured, comprehensive method of studying classical guitar. The handbook contains all the required Grade 3 pieces, scales, chords and arpeggios, as well as sections on musical knowledge, sight-reading and aural awareness - i.e. everything you need for this grade. Includes pieces by Dowland, Sor, Carcassi and others.